The exhibits at AHA! have been carefully crafted to maximize interactivity while amping up the FUN factor. A creative space to express your inner artist. An array of art supplies are available daily with weekly art and craft activities. Sponsored by Cordle Cares Foundation. Step up to the dock and grab a pole. Drop your line and see what you can catch with the magnetic worms. Get your safety hat and goggles on. Hop on in and work the controls. One of our most loved exhibits where a child's imagination can really expand. Horns, sirens, lights and a pretend fire to put out with our laser water hose. Unique structure shaped like a honeycomb. Created especially for you to crawl and climb around in. Go to the peek-a-boo window to be surprised. Start with a shopping list, grab a shopping cart or basket and explore the shelves of our pretend market. Children love to assemble the pizzas or subs and deliver their creations. Connect the tracks and maneuver the trains through tunnels and over hills. Sponsored by The Smoke Stack Hobby Shop. 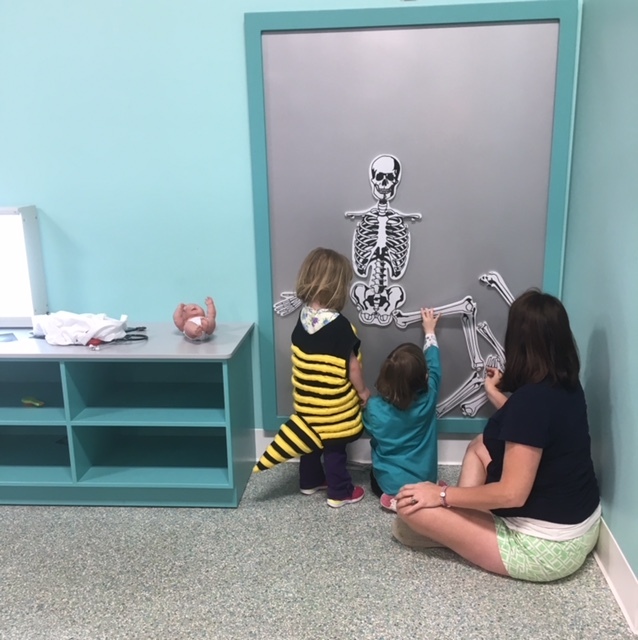 Give our babies an exam and shots, look at x-rays and assemble a magnetic skeleton puzzle. Dinosaur lovers dig into a fossil hunt and dinos with eggs in a sensory experience. A STEAM Zone favorite! Little hands roll play dough, scoop instant snow, squish shaving cream and water beads with changing sensory activities. Children love putting the balls down the tubes and watching where they drop. Take turns collecting and sorting the balls too! Little architects will find our wooden blocks lead to all kinds of buildings and structures. Crank the turning wheel that lifts the platform up into the air. Take turns loading it with foam bricks and hoisting it up! Pots, flowers, shovels, and pretend soil. Put on an apron and gloves. We have everything you need to create your very own garden. Invisible strings play beautiful music with just the touch of your hands. Push the button to try out the different sounds. Squares and triangles fit together on our wall. Plenty of space to create a pattern of your choice. Cozy hexagon shaped area for babies and toddlers to crawl, climb and explore. Sponsored by Pediatric Associates of Lancaster, Inc. This area is ever-changing. Come in and see what we have today. Will it be frogs, toads, insect, fish or something else. Sponsored by Pet Supplies Plus. Do you have a budding veterinarian in the making? Check the health of our stuffed animals. Look at their x-rays too! Sponsored by Lancaster Animal Clinic. Smooth logs, bamboo planks and dowels inspire building play with natural materials. Sponsored by Don Sesslar and Dawn Shonk. Walk up to the window and make your deposit or withdraw. This exhibit gives you the opportunity to talk about money with your child. Use our giant red foam bricks to build the house of your dreams. Measure, pound, twist, and "cut" the pieces to fit with our tools. Get ready to burn some calories with our stationary bike. Push a button to choose your recently consumed food item and start peddling. The screen will count down the minutes it takes to burn it off! Who doesn't love Legos? Hours of fun can be had with our hundreds of Duplo pieces. Have a little drummer in the making? Grab a paddle and discover the noises you can make with the huge pipes! WE ARE CURRENTLY IN NEED OF A SPONSOR! CALL FOR DETAILS! Two sided rolling box hides 6 different object for you to test your sense of touch. There are hints provided in case you need help. Lights, camera, action! Dress up in a costume, grab a microphone and put on a show. Funded and maintained by a grant from the Wendel Fund of the Fairfield County Foundation. Roll up your sleeves and put on a smock. Build a dam and have a duck or boat race. Strap the babies into a seat for a splish-splashing time. Sponsored by the Johns Family. Imagination Playground Big Blue Blocks inspire children to build! From ball runs to forts, loose parts play is fun for all ages.